Taking a queue from Rands Response Hierarchy I wanted to create a prioritized hierarchy to how likely I will respond to a piece of communication. This list is sorted from least to most likely. I will never respond. Especially if it’s Github related and you just saw my email because I starred a repo. I will never respond. 99% of what I receive here is recruiter pam. I even received a LinkedIn request from a LinkedIn recruiter who was inquiring about a job opening at LinkedIn which I read on LinkedIn. Nothing can ever top that so I stopped checking them. I’ll respond eventually if you leave a voice message. For every real phone call, I receive fifty+ robocalls. I now use Nomorobo to take the edge off but I mostly ignore my phone unless we have an appointment. I’ll respond eventually. I don’t always get DM notifications, but when eventually see it, I will reply. If you message me on Facebook Chat, then if you aren’t in my “other inbox”, I’ll reply. I have missed seeing messages for 9 to 16 months at a time because of this “feature”. I will most likely respond. I get hundreds of emails a week and I aggressively filter these messages. I am pretty accessible by appointment to talk on GChat or Talky. 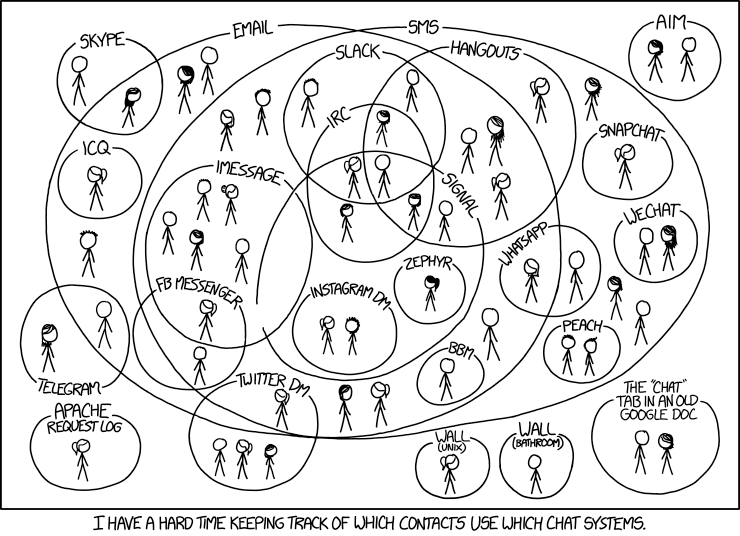 The only limiting factor is that video chat works some days and does not on other days. I’ll respond unless I think the conversation thread has ended. With SMS, that’s easier said than done sometimes. I’ll respond as long as I have the slack organization installed. I only stay logged in on my laptop to about a dozen orgs. I only keep about three to five on my phone. I’ll respond because you are right there. To summarize, digital communication is still the best way to get a hold of me. I am a “social introvert” who enjoys talking to people but I also appreciate async communication because I can reply on my own time and schedule. 56˚F - It was mostly cloudy.